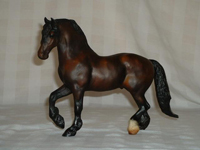 The original Friesian mold was released in 1992 and was sculpted by J. M. Herrick. Since that time, it has grown in popularity maybe because of the simplicity and nobleness of the design. Although the fact that the Breyer company has used it for several very special releases doesn’t hurt either. The picture to the left is Fire Magic – the 2005 BreyerFest celebration Horse modeled after a real Friesian horse with the same name. 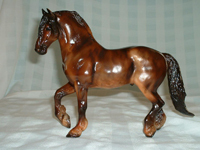 This model is a shaded brown bay with some gorgeous dappling and a wonderful high gloss. Only 4000 were made. The typical full blood Friesian only has the black coat; Fire Magic is the exception to this rule and is what has made him so very unique. If you ever have a chance to watch the movement and temperament of a Friesian horse, take the opportunity. They are simply beautiful. To the right, a matte dark bay from the Action Drafter Set issued in 1994 - 1995. 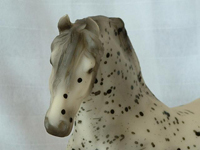 He is a beautiful mold with resist dappling. This is another one of those molds that the value guides don’t have an accurate price on. Each and every time I try to purchase one of these on eBay, the price soars way above the estimated value. (Please notice I used the term “estimate” for a reason.) The molds only flaw is that they can be somewhat tipsy, as with other molds. However, this can be easily corrected for a shelf model as well. The Lots of Spots set is a Series Run for JCPenney in 2000.